Fibromyalgia, a common painful disorder among women in their middle years (40 to 60 years old) is no longer considered a âdiseaseâ but rather a syndrome. The term âsyndromeâ is used to represent a group of symptoms that tend to occur together either at the same time or in close proximity to one another. 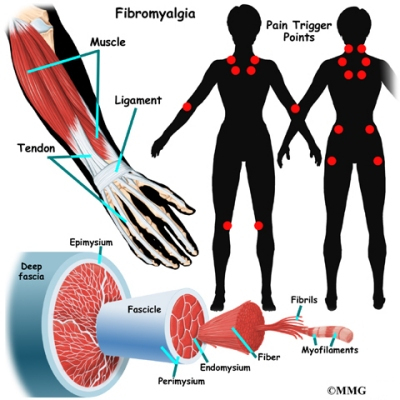 Sometimes fibromyalgia is referred to as fibromyalgia syndrome (FMS). The most common symptom is widespread pain throughout the body, with especially tender spots near certain joints. The pain stops people with fibromyalgia from functioning normally, partly because they feel exhausted most of the time. Fibromyalgia is a chronic (meaning long-lasting) condition that usually requires many years of treatment. It can occur along with other forms of arthritis or all by itself. It can occur after an injury or out of the blue. Pain in fibromyalgia is present in soft tissues throughout the body. Pain and stiffness concentrate in spots such as the neck, chest, shoulders, elbows, knees, buttocks, and lower back. The tender spots don't seem to be inflamed. Most tests show nothing out of the ordinary in the anatomy of people with fibromyalgia. The causes of fibromyalgia are unknown, but one thing is for sure: you're not making it up. Many sufferers have been told that it's all in your head by family members or other doctors. It is true that people with fibromyalgia are often depressed, and that stress worsens symptoms. But depression and stress don't seem to be the driving forces behind the disease. Scientists haven't been able to unlock all of the secrets behind fibromyalgia syndrome (FMS). Right now, the main theory is that FMS occurs when something goes hay wire in the nervous system. That something may be what's called central sensitization syndrome. It means your nervous system is ramped up to react too soon, too often, and for too long. With a dysregulation of the central nervous system like this, there appears to be some kind of mistake within the nervous system in how it recognizes and transmits pain messages. Somehow, the nervous system seems to think even the simplest touch is a noxious (painful) stimuli. Nervous system dysregulation of this type is likely caused by biochemical abnormalities, altered brain blood flow, and problems with the pain processing mechanisms. Sufferers have lower pain thresholds and lower levels of serotonin, a brain chemical involved in pain, sleep, and mood. Sometimes FMS occurs as a result of an injury or some other medical condition. For example, patients with rheumatoid arthritis or Lyme disease (inflammatory diseases), metabolic dysfunction (e.g., thyroid problems), or cancer often develop a type of FMS referred to as reactive fibromyalgia. It's important to identify whether or not the FMS is primary (the main problem) or secondary (caused by other problems). Folks who have fibromyalgia syndrome (FMS) often have certain triggers that seem to bring on (or increase) symptoms. The triggers vary from person to person but may include degenerative (spinal) disc disease, headaches (all kinds), irritable bowel syndrome, reflux (heart burn), trigger points of the muscles, and poor posture. Anxiety, depression, and post-traumatic stress disorder also seem to be linked with FMS. Having a bipolar illness increases the risk of developing fibromyalgia syndrome (FMS) dramatically. About 80 percent of all fibromyalgia patients report serious problems sleeping. Because fibromyalgia is so strongly connected to sleep disturbance, in some cases it is possible that the sleep disturbance may be a major contributing factor. In fact, studies have produced fibromyalgia-like symptoms in healthy adults by disrupting their sleep patterns. New evidence suggests that fibromyalgia is really caused by a dysregulation of the central nervous system. There appears to be some kind of mistake within the nervous system in how it recognizes and transmits pain messages. Somehow, the nervous system seems to think even the simplest touch is a noxious(painful) stimuli . It's like a ten-alarm fire signal is sent to the brain when a breeze blows by the barn. Nervous system dysregulation of this type is likely caused by biochemical abnormalities, altered brain blood flow, and problems with the pain processing mechanisms. Sufferers have lower pain thresholds and lower levels of serotonin, a brain chemical involved in pain, sleep, and mood. How do doctors identify fibromyalgia? In some patients, doctors may recommend X-rays to look at the bones near painful spots. The X-rays will not show fibromyalgia but are used to make sure there are no other causes of your pain. Other special tests such as electromyograms, which measure the contraction of muscles, may be used to try to determine if the muscles show abnormalities. Most of the time these tests are negative. A sleep history, and possibly a sleep study, could be important to the diagnosis. Other conditions can occur along with fibromyalgia that can confound the diagnosis. In some cases, other problems such as Lyme disease, Epstein-Barr virus, viral hepatitis, HIV infection, and thyroid problems mimic fibromyalgia making the diagnosis more difficult. Chronic fatigue syndrome (CFS) may need to be ruled out. CFS is another disease that is difficult to diagnose and has puzzled doctors for many years. CFS and fibromyalgia share many symptoms, especially the severe exhaustion. The major difference is that CFS causes flu-like symptoms, such as low-grade fevers, sore throats, and swollen lymph nodes. There have been some significant breakthroughs in our understanding (and therefore treatment) of fibromyalgia syndrome (FMS). Today's modern approach is multimodal, meaning many different treatment options are pursued at the same time. Combining medications with exercise, behavioral counseling, and alternative medicine have made it possible to live a more normal life for those who suffer with this condition. Usually the first step in the treatment of fibromyalgia is to help patients understand this complex and frustrating disease. Many patients are relieved to learn that the disease is not all in their head. After that, the task is to manage the pain and exhaustion. Until the exact pathologic pathways are understood, treatment will be more of a management approach. The first-line treatment for fibromyalgia includes medications and a variety of other nonpharmacologic (nondrug) treatment. There isn't one magic pill patients can take to wipe away the pain, improve sleep, or restore energy. Instead, a wide range of medications are available that can act on the nervous system in a variety of ways. These include tricyclic antidepressants, selective serotonin reuptake inhibitors (SSRIs), selective serotonin-norepinephrine reuptake inhibitors (SSNRIs), and anticonvulsants (also known as antiepileptics). And for the first time, there are some medications now FDA approved from these categories specifically for fibromyalgia (e.g., pregabalin, duloxetine, milnacipran). In the past, many of the medications were used off-label. This means the medications were intended for something else (like seizures or depression) but were found to be effective for fibromyalgia. Two of these drugs (duloxetine and milnacipran) are antidepressants. Studies have shown that these medications don't work because they improve the person's mood (reduce depression). The chemical pathway of the drug seems to impact pain signals directly. Neither one of these drugs seems to improve sleep. They do improve energy levels, physical functioning, and cognitive function -- probably because they reduce pain, a symptom that can bring a person down in all these areas. Pain relievers, whether over the counter or prescription, are generally not effective by themselves. Many pain medications are addictive and should be used with caution. Mild pain medications may help in combination with other treatments. Opioid (narcotic) pain relievers, corticosteroids,and nonsteroidal antiinflammatories (NSAIDs) are no longer recommended. All of the research so far confirms the need to treat this problem with a multidisciplinary approach. A multidisciplinary team of professionals includes doctors, nurses, physical therapists, psychologists, pharmacists, nutritionists, and other practitioners in the healing arts. Youâll notice that exercise is listed first in the list above. Thatâs because there is a lot of evidence from good scientific studies that any form of exercise but especially isometrics (contract, hold, relax individual muscles) can be helpful. Pilates-based stretching, yoga, and low-impact aerobic exercise have the greatest benefit. 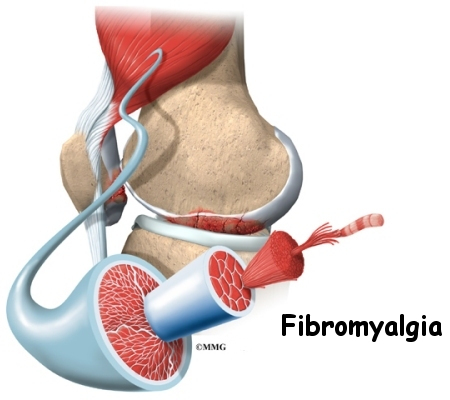 Anyone with fibromyalgia syndrome (FMS) must be very careful when trying weight-lifting, rowing, or jogging. In fact, these are not really recommended during painful flare-ups. Many people with FMS don't have any real trouble during exercise. It's the painful joint and muscle "after shock" that is the worst. Some can barely get out of bed the next day after what seems like a mildly strenuous work out. Thatâs why itâs important to have a physical therapist evaluate you and prescribe the optimal mode (type), frequency, intensity, and duration of exercise on an individual basis. There isn't a one-size-fits-all type of program because of the wide range of physical abilities and disabilities among adults with this condition. Patients must learn as much as they can both about this condition as well as about themselves and what works best for them. That's easier said than done. Many times the pain and fatigue keep patients from getting the exercise they need. They become deconditioned and weak, which adds to their pain and loss of function. This is another place where medications can be very helpful. Medications can help get the pain under control so that the person can move and exercise again. Sometimes several medications are combined to get the most relief of symptoms with the fewest adverse effects. Some medications address the pain or sleep issues, while others deal with the anxiety, depression, or other psychologic disorders. Early recognition, diagnosis, and treatment can provide a faster resolution of symptoms and much improved prognosis. Reducing and managing symptoms, improving quality of life, and decreasing distress are reasonable goals. But the patient must understand that at the present time, there is no one-best treatment that works for everyone with fibromyalgia. In the ideal plan, the patient is really the manager who consults with these other experts to formulate the most effective plan. Treatment (or more accurately, the management plan) will likely last for many years. Patients do get better. In the ideal plan, the patient is really the manager who consults with these other experts to formulate the most effective plan. In fact, there is new evidence that half of all adults diagnosed with fibromyalgia early in the development of their disease (and who are adequately treated) no longer have this problem two years later. Many others have reduced their pain to tolerable levels.